Four human men. One female witch. And a magical pregnancy spell that must be enacted to save her town. The town of Love's Hollow is supposed to be a magical, safe place for non-humans. But it's being invaded by humans due to the fact that no one has activated the seeding spell that wards them off. Gwendolyn Bishop is the witch who is supposed to save the town by enacting the spell. But she can't, because she isn't pregnant or a mother, which is a necessity for the spell to work. In fact, she is still a virgin. As the Harvest Festival looms before her, the time to work the seeding spell draws closer, and Gwendolyn is at a loss as to what to do. To make matters worse, the Lucky Spell Pot, the pub her grandmother left her, which has been in her family for four generations of witches, is in the red due to the influx of human businesses taking over the formerly magical town. One such business is Reverb Tech, a tech firm owned by four human male billionaires: David, Alex, Eric and Travis. When they show up in The Lucky Spell Pot one night, Gwendolyn is immediately attracted to all four of them. 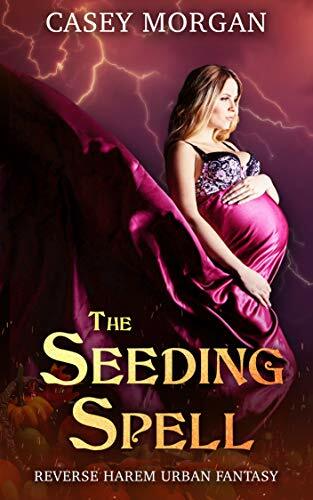 She decides one of them will help her father a child and enact the seeding spell. But which one? David is commanding, a boss in life and in his company. Alex is a fun-loving free spirit. Eric is calm, considerate and serene. And Travis is all man: from his demanding voice to his sculpted muscles. Gwendolyn doesn't know how to choose, but when her quest for the financial stability of her pub pushes her to great lengths, even to sell her virginity, she hopes that multiple goals can be accomplished if one of these men buys her and saves the town. Or will she not have to choose, because she can have all four men at once and also save them all? The Seeding Spell is a full length reverse harem fantasy novel.